I picked up a couple of bargains in the recent Space NK Sale. I went into a few stores and found there is a huge difference in the quality of the sale depending on which location you go to – the one I picked up my bargains is the one on Kings Road, near to the Sloane Square end. It had a good range of stuff and at pretty irresistible prices. I was very pleased to get the Sonia Kashuk bits as I missed out on the first time around when they were in the sale earlier this year. 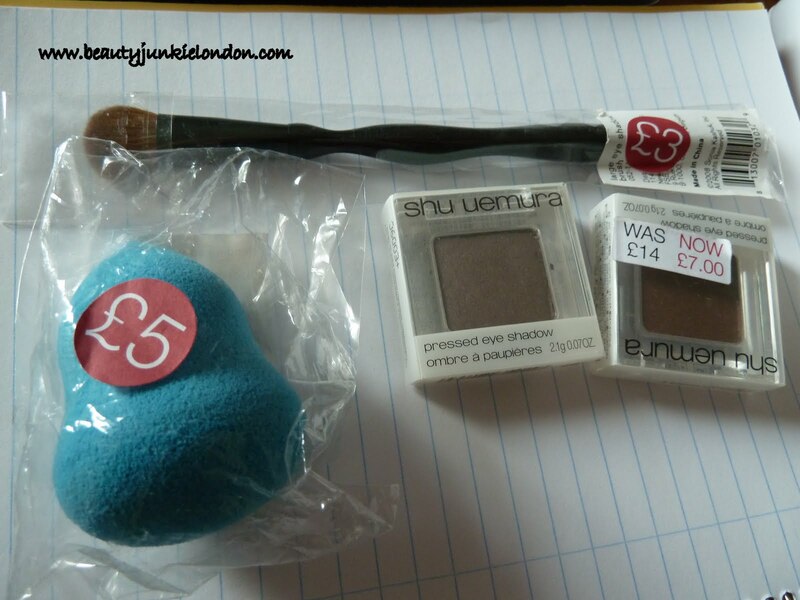 The prices were all bargains – e/s were £7 each (reduced from £14, the eye shadow brush was £3 and the sponge was £5. I am very very happy to have the Shu Uemura shadows in particular, although it could be a new addiction in the making… dangerous. What are the best beauty sale bargains you have found – in Space NK or somewhere else?? ooo you got some lovely bits. Those e/s are most definitely a bargain, they look like really nice shades!